Holy cow, check out Cornerhouse's glorious new website! What an improvement. I may return frequently just to hear those cool sound effects ... no wait, I just got sick of them. Oh well, that's what the mute button is for. I happened by because Bournemouth Runner tipped me off about an event that's happening over there in conjunction with the Tijuana Organic exhibition that opened last night. and is going down Thursday 27 April at 6. "An informal discussion on collaborative and alternative media projects. The event will feature participants in person and online, from multimedia projects, artist's groups and communities in Tijuana, Manchester and the North West. This one-off multi-channel broadcast will also be streamed live by Trafford based Let's Go Global as part of their regular Thursday show. Drop by in person, or join in online via iChat." 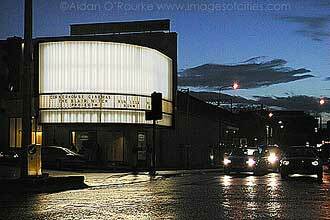 Next week promises to be a busy one for arty folk as the Commonwealth Film Festival opens Friday night. (I never understand what they're talking about when people call it ComFest, which sounds to me like it might be a computer programmer's conference circa 1983). Haven't had a chance to look at the programme yet, but there's always some winners in there. What sound effects? I couldn't hear anything! The redesign looks cool, although I suspect that moving banner may get very annoying very quickly. Still, its a huge improvement on the old one. Mmmmmh! Suppose its ok once but then it'll get exponentially more annoying with each viewing! I think i'll just avoid that page and just bookmark the 'main' site. Ahhh.... I totally understand, f. Commfesht.